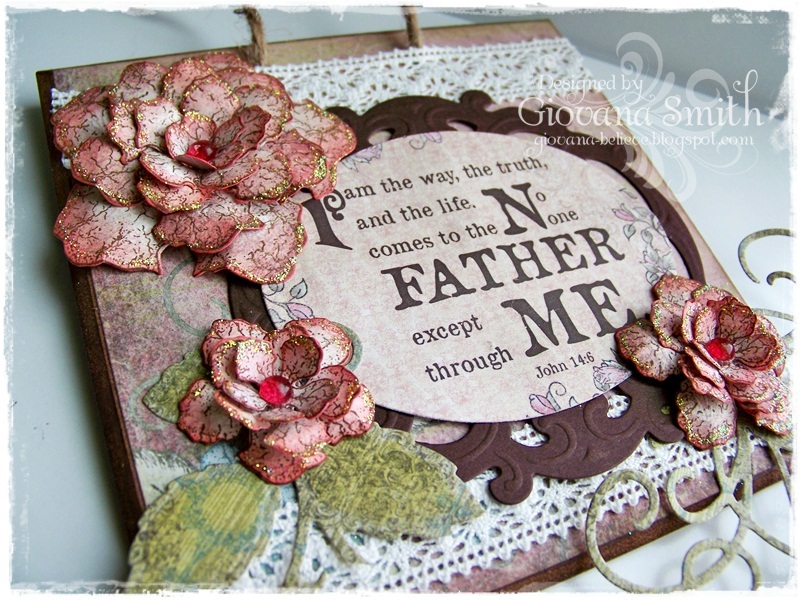 The Design Team for Gina K. Designs welcomes you to another fabulous Inspiration Blog Hop!!! Gina and the Design Team will inspire you with many beautiful ideas! And as you hop through their blogs, make sure to leave a comment on each of them because we will choose a few random comments and those stampers will each win a grab bag of Gina K. Designs products! To see the full list of winners check the Big News forum at Stamp TV a couple of days after the hops!! StampTV Kit: This time the new StampTV Kit has 2 sets: Merry Little Christmas and City of David. Both sets are great for your Christmas projects, one is super cute and the other one is more inspirational. Make card base from White Cardstock. 5" square. Cut a piece of Patterned Paper (4 1/8 " square). Mat all the panel and add stitches. Add panel to card base. Stamp image on White Cardstock in Memento Tuxedo Black Ink, color it with Copic Markers. Die-cut image with Square Nestabilities. Die-cut and emboss a Fleur de Lis Square Piece, cut it diagonally and adhere it to image piece, add stitches. Add image to card with Pop dots. Add Star Dust STickles and White Opal Liquid Pearls to snowflakes. Make a bow with bow-easy and adhere it to card. Stamp images on White Cardstock in Watermark Versamark Ink, add Gold embossing powder and heat it up. Die-cut and emboss image with Circle Nestabilities. Die-cut and emboss a piece of Good as Gold with Scallop Circle Nestabilites. Mat pieces with Pop dots and add it to card. Stamp sentiment on White Cardstock in Memento Espresso Truffle Ink. Die-cut and emboss piece with Fancy Tags Nestabilities. Add tags to card with Pop Dots. Add a strip of Gold Washi Tape to the bottom front card. Free With Three Set: This time is the "Holiday Tags" set. I decided to use the small image and create little ornaments. Cut a panel from White Cardstock (3.75" x 5") add Patterned Paper from "Blizzards Collection", add zig-zag stitches. Stamp images on White Cardstock, color them with Copic Markers, then die-cut, emboss and stencil them with Holiday Tags Shapeabilities. Add little oranments to card panel with Twine. Stamp sentiment in Memento Espreso Truffle. Make card base from Dark Sage Cardstock. Cut a panel from White Cardstock, Stamp long cord and little light bulb heads in Memento Tuxedo Black, then stamp the light bulbs in Memento Cantaloupe, Lady Bug and Bamboo Leaves. Stamp saying in Memento Lady Bug Ink. Mat stamp image with Lipstick Red CS, add stitches. Add Crystal Lacquer to all light bulbs, then add little pinches of glitter while the Crystal Lacquer still wet. Accessories: Crystal Lacquer, Glitter, Scor-tape, Sewing machine. Simple Snowflakes: Set ilustrated by Tami Mayberry. Another CAS card :) No ribbon here either, but I added some tinsel and rhinestones to make it very shiny. Cut a panel from White Cardstock, stamp snowflakes and sentiment in Memento Love Letter Ink. Cut a strip of Patterned Paper (1" x 3.75") from "Merry Little Christmas" Collection, add it to panel. Mat panel together and add White and Red Tinsel and Red Rhinestones to snowflakes and top corner. 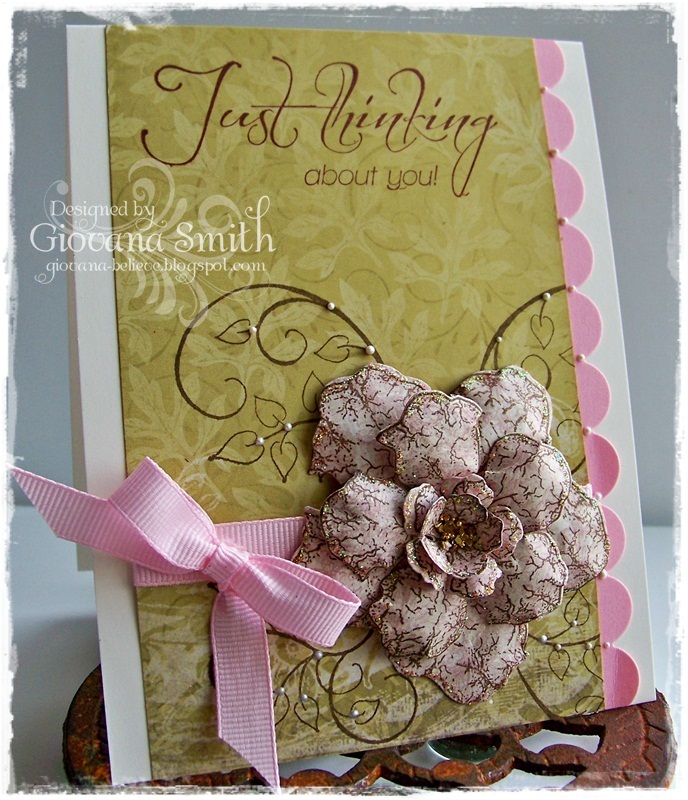 Make card base from Warm Cocoa Cardstock. Cut a panel from Ivory Cardstock (3.75" x 5"). Stamp images in Memento Bamboo Leaves and Memento Lady Bug. Cut a strip of Dark Sage Cardstock and stamp sentiment in White Craft Ink, add it to Ivory panel. Mat this piece with a slightly bigger white piece, add zig zag stitches. Tie on ribbon and add panel to card base. Add a button and little bits of Star Dust Stickles to image. 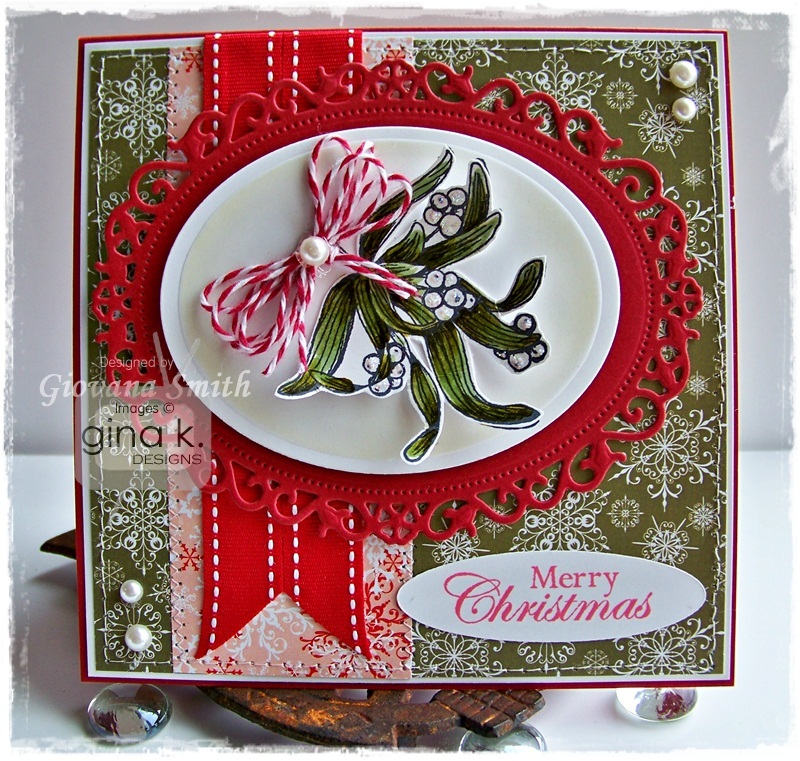 Stately Flowers 5: For this card, I decided to use the Mistletoe image and create a Christmas card. Make card base from Lipstick Cardstock. 5.5" square card. Mat White Cardstock and Patterned Paper, add stitches. Add Red Stitched Ribbon and adhere panel to card. Die-cut and emboss a piece of Lipstick Red CS using Floral Oval nestabilities. Stamp image on White Cardstock in Memento Tuxedo Black, color image with Markers. Stamp and color an extra image, then cut it out. Die-cut, emboss and stencil image with Oval nestabilities. Adhere it to Floral Oval piece with Pop Dots. Add it to card base. Make and add a bow from twine. Add a peal. Add extra image, curving all the ends. Add Star Dust Stickles. 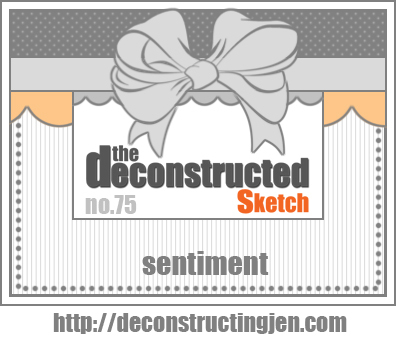 Stamp sentiment on White Cardstock in Memento Love Letter Ink. Ink: Memento Tuxedo Black, Memento Love Letter (Tsukineko), Copic Markers. Cut a panel from Sandy Beach CS (3.75" x 5"). Stamp image in Memento Espresso Truffle, color it with Copic Markers.Add stickles and Ruby Liquid Pearls to flowers. Stamp sentiment in Memento New Sprout Ink. Cut a strip from Dark Sage CS (1" x 5"). Die-cut and emboss a border piece from Innocent Pink CS, add it to strip piece and add zig-zag stitches. Tie on ribbon, make a bow with bow-easy and adhere it to panel. Add White Opal Liquid Pearls to border. Ink: Memento Espreso Truffle, Memento New Sprout (Tsukineko), Copic Markers. Accessories: Pop dots (GKD), Classic Bracket Edgeabilities (Spellbinders). Have a fantastic day and happy hopping!! 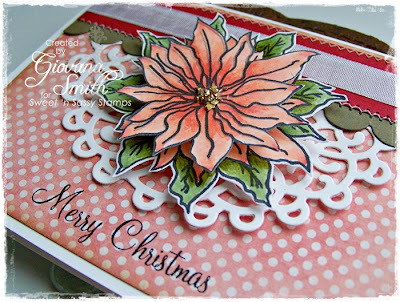 Here is my card, a Pink poinsettia, sure I am in the Christmas mood :) The sketch is from Deconstructed Sketch #75. Cut a panel from Patterned Paper (5.25" x 4"), add a strip of Cranberry Tart CS, die-cut a scallop border and add stitches. Tie on ribbon. Die-cut swirl piece in White Cardstock, add it to card. Stamp Poinsettia image on White Cardstock in Memento Tuxedo Black, color images with Copic Markers (E02, R20, R22, YG63, YG95, YG97), cut out images and adhere them to card with pop dots. Add Gold Gala Glitz to center of Poinsettia. Accessories: Scallop Border Die (Sweet 'n Sassy Stamps), Layered Elegant Swirl Die (Heartfelt Creations), Sewing machine. Hello my friends! Sorry I've been too quiet lately, I am working really hard to show you pretty projects next week! Let me show you the card I have for you today. The image is from Latina Crafter, this set is called "Dando la Pelea" (Fighting). The button says Faith, Hope, Love, also from Latina Crafter. Make card base from Ivory Cardstock (A2 size). Cut a panel from Delicate Asters Patterned Paper, ink all edges. Add scallop border. Stamp leaves in Walnut Stain Distress Ink. Tie on ribbon and adhere panel to card front. FLOWER: Stamp flowers on a piece of Vintage Floret Patterned Paper in Aged Mahogany Distress Ink. Work every petal with Blossom Kit, add Dries Clear Glue to all edges and add glitter. Mount all flowers and add gold Gala Glitz to the center of flower. Hello my friends! Happy Monday :) Hope you are starting a great week. Let me show you the card I have for you today. It's a Wedding card using Latina Crafter Stamps. Make card base from White cardstock. 5.5" square. Mat Lavender Cardstock and Patterned Paper, add a strip of coordinated Patterned Paper and add stitches. Stamp image on White cardstock, color it with Markers. Die-cut, emboss and stencil image with Floral Oval Nestabilities. Add image to card. The flowers were white, so I colored them with V01 Copic Marker, add them to card and add pearls. Create a double bow and add it to card. Cut a piece of Lavender Cardstock, add a strip of Patterned Paper and add stitches. Stamp sentiment on tag from patterned Paper. Adhere it to panel. Accessories: Floral Oval nestabilities (Spellbinders), Adhesive (Latina Crafter, Pop dots, Sewing machine. WELCOME TO THE OCTOBER “GIVING THANKS” BLOG HOP! Hi everyone! Thanks for playing along in our October blog hop! EXCITING NEWS! The Blog Hop with Sean & Regina will now be featuring Gina K. Designs stamps only for our monthly blog hops starting this month! Most everyone we know are busy getting ready for the Halloween fun coming up on the 31st. We spooked it up for you in our last hop, so this month we want to celebrate November by “Giving Thanks” to all of our followers. To some “giving thanks” is the traditional Thanksgiving holiday, but to others to “give thanks” is to show appreciation to all those great family and friends in our lives. So, our hop this month is to show you how different we all give thanks. The blog hop designers have been busy creating a card or cards that we hope will inspire you to create your fall themed “thanks” cards whether it be Thanksgiving, Give Thanks, Happy Harvest or a simple Thank You. 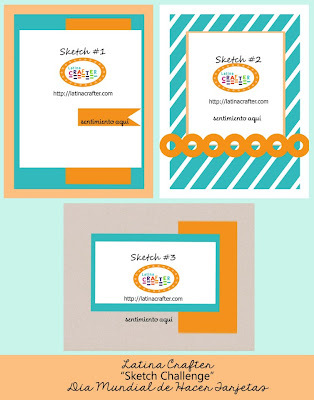 Becky Oehlers is a member of the Gina K. Designs Illustrator Team! Becky’s style is really fun, crisp and clean. They are used to make wonderful cards with just the right message or can be used to add some fun to your scrapbooking pages. In addition, Becky is one of the best card designers and artists in the craft world. Go to Becky’s blog to look at the great things she has been up to AND view the card samples she has created with her newest stamp set “Mistletoe Memories” that was released yesterday during the Stamp TV October Release Party. I have 2 cards for you today!! Happiness is: This is a very Clean and Simple card, easy to mass produce if you would like to send cards to your family and friends. 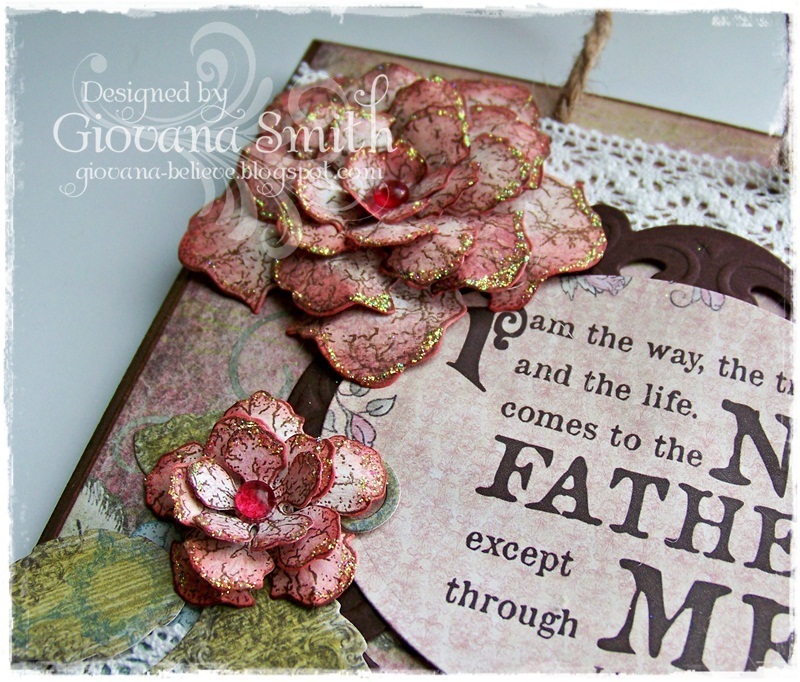 Make card base from Sweet Corn Cardstock. Mat a piece of Chocolate and Ivory Cardstock. Stamp sentiment in Vintage Photo Distress. Cut strips from Sun-kissed Autumn Patterned Paper (0.5") and adhere them to panel. Stamp leaves on White Cardstock in Wild Honey, Scattered Straw, cut them out and ink edges with Vintage Photo and Peeled Paint Distress Ink. Adhere leaves to card. Make a bow from raffia and adhere it to panel. Thankful for you: I love this "Duo set", the image is so much fun to color. Cut a panel from Ivory Cardstock.﻿ Distress all edges and stitches. Score few lines at the bottom part and stamp sentiment. Adhere panel to card base. Stamp image on White Cardstock and color it with Markers. Die-cut, score and stencil it with Oval Nestabilities. Die-cut and stencil a piece of Cherry Red Cardstock using Floral oval Nestabilities. Mat both pieces and adhere it to card. The deadline for leaving comments is Monday, October 22, 2012 at 8pm CST. The winner will be chosen and announced on Tuesday, October 23, 2012. Thank you for visiting my blog. Now, go to Cat’s blog. and enjoy her creations!! Hello!! Hope your day is great, enjoying the Fall weather, although here in this part of the NW feels more like Winter later. This is one of the cards I created for my challenge. I used Heartfelt Creations dies and stamp. Mat Pink Cardstock and Patterned paper. Add zig-zag stitches. Die-cut and emboss window, flowers and leaves. Add them to card. Stamp sentiment on White Cardstock. Die-cut and emboss it with Wonky Rectangles Dies. Hello my friends!! 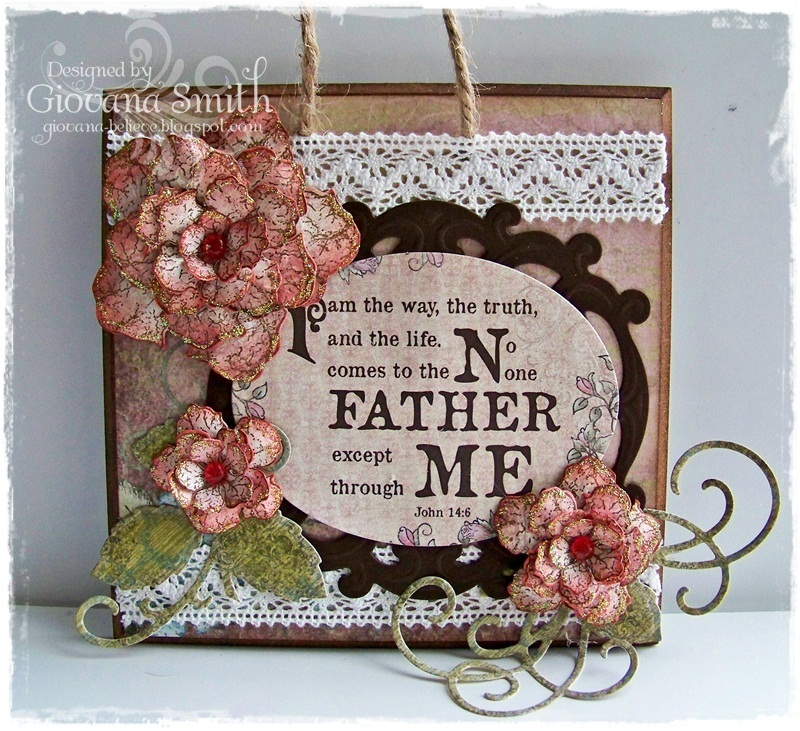 I have a really cute project for you today using the brand new "Vintage Floret Collection" from Heartfelt Creations! I had a lot of fun making this Wall Decor. Ink frame edges with Walnut Stain Distress Ink. Cut a piece of Vintage Floret Patterned Paper and glue it to frame. Ink edges of Patterned Paper. Flowers: Stamp flowers direct onto Patterned Paper in Walnut Stain Ink. Die-cut them with coordinated dies, ink all edges and work each flower petal with the Blossom Flower kit. Apply Dries Clear Glue to every edge and add Glitter. Create flowers, add a red dew drop in the center and set aside. Die-cut and emboss Oval Window in Chocolate Cardstock. Die-cut saying from Patterned Paper using Oval Nestabilities. Mat this with Oval Window. Die-cut, emboss and stencil Leafy Spray using Patterned Paper, cut it in two. Add White Lace Tape to frame. Add Oval Frame, leaves and flowers. HCD 712 Bella Rose Die "Leafy Spray"
Hello my friends! Hope you all are having a great Monday!! Today I have a couple of projects to share with you. I created these for "World Card Making Day" for Latina Crafter. Both cards used the set "Hoy es tu dia"
This card is super cute and easy to make. The sentiment says "Wishes of Happiness", what I love most about this card is the background, I created it with Washi Tapes, the flowers were white, so I colored them with Copic Marker R24, then added pearls. This card is also one of my favorites, another CAS one. This card is 4" square. I die-cut the Patterned Paper using Square Nestabilities, then I embossed a white panel and added the PP pieces. 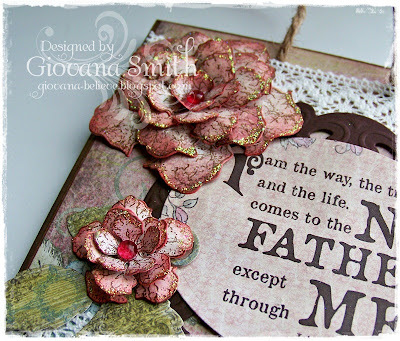 The sentiment was die-cut, embossed and stenciled. I created a triple bow with Twine., then added a button and a pearl. 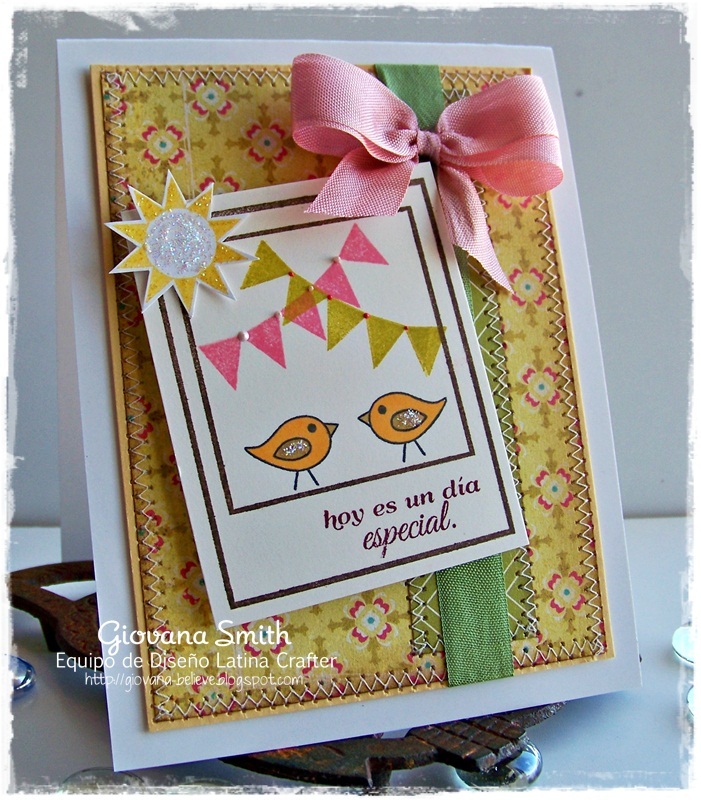 Latina Crafter is offering a special KIT so you can CASE these cards too!! Submitting these cards to Simon Says Challenge "Dies/Punches"
Sweet 'n Sassy Stamps "October Release Day"
The blog hop starts at Sweet ' n Sassy Stamps Blog. We've got lots of eye candy to share that will certainly put you in the holiday mood. :) Be sure not to miss a single stop along the way because we'll be drawing one lucky commenter from a random DT blog to win a $25 credit to the store!! Merry Christmas: This card is really a "Clean and Simple" one. It took me only 10 minutes from start to finish. I used "Old Fashioned Christmas" Set. 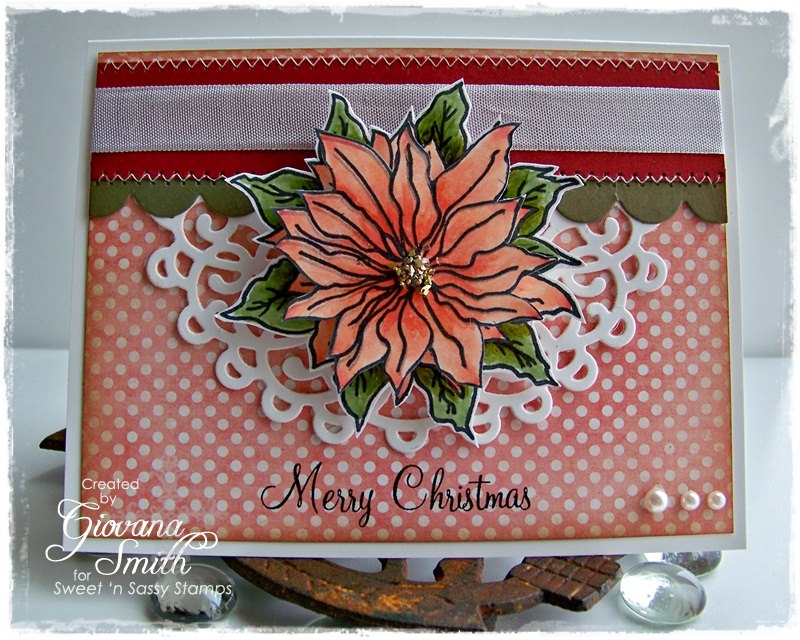 Glittery Poinsettia: This card is more my style :) I used "Poinsettias" set. The Poinsettia was stamped twice on White Cs and color with Copic Markers. Added Glitter on leaves and poinsettia edges, the center was covered with Gold Gala Glitz. The sentiment was stamped on Ivory cardstock in Archival Black Ink. A lot of distressing and stitches. Enjoy the hop and happy stamping!! Hello!! Sorry I am a little bit late posting the winner of the Washi and Fabric Tapes. The winner is Tammie Lien!!! Thanks so much to all who participated. I will have another giveaway soon! Heartfelt Creations "Vintage Floret" Release!! Hello and welcome to the October Heartfelt Creations Release!! This month's release is fabulous and really pretty! The Vintage Floret release is a beautiful collection of ancient luxury. This month’s paper release is similar to the wallpaper of a quaint Parisian café. The textured flower stamps add a quiet delicacy to every project. The typography is a delightful combination of botanical growth and grandmother’s old typewriter stored away in the attic. There are 5 new PreCut Stamp Sets, one 12x12 Paper Collection, and one beautiful new exclusive Spellbinders die designed for Heartfelt Creations. Leave a comment on the HC blog by October 16th and you will be eligible to win the entire release valued at $134.93 . This is the project I created for you! Cut a panel from Chocolate Cardstock (5.25" square) and a piece of Vintage Floret Patterned Paper, cut a strip of coordinated paper and adhere it to bigger piece. Mat all together and add stitches. Tie on ribbon and add brad. Add panel to card base. Stamp image on Watercolor Paper in Black Archival Ink. Color image with Distress Inks. Die-cut, emboss and stencil image with Labels 1 Nestabilities. Using Dry Clear Glue and the Metal Tip, add glue to the swirl areas and add glitter. Adhere image to card front with Double Dots. Stamp the smallest flower on Watercolor Paper, color them with Distress Ink and die-cut. After that sponges all edges with Barn Door Distress Ink. Add Gold Gala Glitz to every flower. Add flowers to image. Add Crystal Lacquer to every leaf. Ink: Ranger Distress Inks (Tumbled Glass, Worn Lipstick, Barn Door, Peeled Paint, Ages Mahogany, Vintage Photo), Black Archival. Accessories: Seam Binding Ribbon (etsy), Sewing machine. 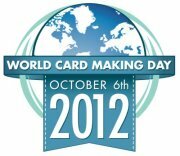 World Card Making Day Celebration!! Hello my friends!! Latina Crafter is joining the celebrations of World Card Making Day! and has created a lot of challenges and prizes for you!! Please join us at our Facebook WCMD page. I will be posting lots of projects I have prepared just for YOU!! I used the sets "Polaroid" and "Banderines". Edited to add: I had a super busy Saturday, goodness it took forever to be back home, but I am updating this post with more creations!! Now, let me show you a card I made using Heartfelt Creations dies and stamps!! Today I am hosting a challenge over at Splitcoastampers "Dies and a sentiment"
And another card using dies and stamps from Sweet 'n Sassy Stamps!! Now, leave a comment here and I will be giving away 5 rolls of Washi tape and Fabric Tape!! (Picture coming later) I will announce the winner next Wednesday October 10th!! Thanks so much and have a lot of fun creating today!! World Card Making Day with Gina K. Designs! !